“Hold on,” I said. As Aly screamed beside me, I tried not to show my frustration. “I need to help your sister first.” This was the first I’d heard of Maddie’s burn. Maddie’s anger flared. “You always help her first! You don’t care for me at all!” She rushed back to our cabin as I finished bandaging Aly’s hand. An event creates pain or distress that sets off the child’s anger. This event can be something another person says or does, or an unmet expectation. Finally, a behavioral response occurs. The trigger thoughts, emotions, and physical reaction evoke a fight, flight or freeze response. We often try to lecture our children or teach them a lesson in the midst of their angry cycle — right when they cannot think rationally. Our best efforts at correction will likely not get through when our child is in this highly emotional state; harsh discipline often makes things worse. 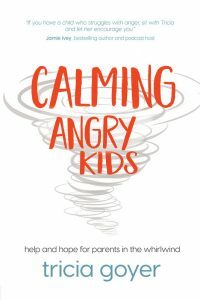 When I acknowledge my children’s anger, they see that I’m paying attention. And when I make myself available, my kids can turn to me for help. They do want to make good choices; they just need extra guidance, and they are often grateful for my offer to help instead of simply sending them to their rooms or giving them consequences. Being available and attentive always works better than simply telling a child to calm down. 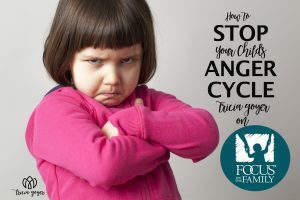 And choosing the right words in the midst of your child’s angry cycle can defuse the situation and lead to healthy resolution.